Click here for a Google Map of Chabad House, the University, and the surrounding apartments and hotels. If you are coming to Chabad House By Local Bus click here. From Binghamton Airport you can either take a taxi or rent a car. 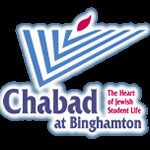 To drive to Chabad House from the Binghamton Airport, Take Airport Road south for 7.7 miles. Get onto NY Rte 17 W. Take NY Rte 17 West to Exit 70 South. Follow Route 201 South to the end, merging onto Vestal Parkway/ Route 434 East. Make a right onto Murray Hill Road, the first traffic light after the university. Chabad is located 1/3 of a mile down the road on the right, at 420 Murray Hill Road. Binghamton is serviced by Shortline and Greyhound Bus services. If you still need help, you can call us at (607) 797-0015 and we will be happy to assist you! Starting from Hillside Community, walk down towards Susquehanna Community via the path between Adirondack and Palisades Halls. In Susquehanna Community, walk through Parking Lot M, towards Hinman College. Walk through Hinman College, past Cleveland Hall, the Dinning Hall, Lehman, and Roosevelt Halls, and the Hinman Library, down to the brain.Make a right, and head towards College in the Woods. From Mountainview College,walk down to the brain, via the path under the dinning hall, or through the lower Parking Lot, then by the CIW co-rec field and into the Parking Lot in front of the Engineering Building, down the stairs, and onto the brain, towards Mohawk Hall. From College in the Woods, walk down to the brain, and head towards Dickinson and Newing. From Dickinson Community, walk towards Bingham Hall in Newing. In Newing, walk to the end of Parking Lot S1, next to the back of Bingham Hall. After the parking lot ends, and the service road to Broome Hall begins, you will see a path that goes down the hill, into the forest. You will go over a small bridge and creek.Walk past the building on your right, the Newman House, and you will come to Murray Hill Road. Make a right onto Murray Hill Road. Chabad House is the fourth house on the right, at 420 Murray Hill Road. Please note that Vestal Parkway has virtually no sidewalks, so please be very careful when walking to and from the hotels on Shabbos. Route 201 South via Riverside Drive, Floral Avenue, or Main Street.Follow Route 201 South to the end, merging onto Route 434 East. Make a right onto Murray Hill Road, the first traffic light after the university. Chabad is located 1/3 of a mile down the road on the right, at 420 Murray Hill Road. Take the Binghamton University Blue Bus routes: Binghamton, Leroy Southside, or Southside Main from the Dickinson Dining Hall Bus Stop. You can also take Broome County Transit Route #5 from the Mohawk Bus Stop. Take any of these buses, and get off by the Hayes Apartment Community. Walk north on Country Club Road, and make a left onto Oxford Place.Walk to the end of the street. Chabad House is on the other side of Murray Hill Road, # 420. -For schedule information, visit The Off Campus College Transport Website for the Blue Bus, and http://www.ridebctransit.com/ for the Broome County Bus. -Students ride all buses free with Binghamton University ID. You may park in the driveway, but we ask that you do not block in any other cars. Parking on Murray Hill Road is allowed only on Chabad's side of the street. However, it is short term parking only, so you cannot park there overnight. On-the-street parking is also available on Oxford Place, which is perpendicular to Murray Hill Road, and Midvale Road, which splits off of Murray Hill just south of Chabad House.